On the Eastern side of the city, most of the Politburo had left their homes early and made their way to Karlshorst, where they could hide from the expected crowds. In fact, they wound up spending the entire day there, standing around the office of the Soviet ambassador, Vladimir Semyonov. This was not a voluntary activity. At one point, Ulbricht asked to return home, and Semyonov snarled at him: “And if anything happens to you back in your apartment? It’s all very well for you, but think what my superiors will do to me.” It was perfectly clear who was in charge: at lunchtime, the Politburo learned that the Russian authorities had unilaterally imposed martial law on East Germany. The Soviet “state of emergency” would last until the end of the month. Loest went out, along with a colleague. As a precaution, they put their party badges in their pocket. Brüning waded into the crowd as well. So did the journalist Klaus Polkehn, who had taken the U-Bahn into the center of town and wanted to find out what was going on. By then, tens of thousands of people were walking down Unter den Linden and toward the House of Ministries, the headquarters of the East German government, the outside of which was adorned with Aufbau der Republik, Max Lingner’s mural. Hans-Walter Bendzko, a border control officer, was watching the same crowd but from the other side of a barricade. That morning, he had been told to report for special duty and had been sent to the House of Ministries as a security guard. He didn’t know who was in the crowd, East German construction workers or West Berlin provocateurs. He only knew that it was not a “normal” demonstration, with banners and slogans, but rather “a dark mass that moved back and forth.” “I thought they wanted to storm the ministry, I was afraid that there would be a fight, but I did not know what was going on.” When Bendzko heard the tanks, he panicked, thinking, “This is the moment when the Americans will interfere.” But as they approached, he saw—with enormous relief—that they were Soviet T-34 tanks, with red stars. Arnold, looking down from his window above, was also relieved: “It was a kind of liberation. It stopped the pressure.” Two of the tanks slowly drove into the crowd around the building. People moved aside to let them through. One of them halted in front of the House of Ministries, and, as Bendzko looked on, the commander of Soviet troops in Berlin emerged. He got out and walked through our cordon to the House of Ministries. And then he came back, got up on the tank, said something which, of course, nobody understood. Maybe he was announcing martial law. Then the tanks turned away again and moved toward Potsdamer Platz. And everybody ran away. Some were caught and arrested … The troublemakers started to attack the tanks. One of them got a large beam from among the rubble and put it under the wheel of the tank so the chains wouldn’t move. Some of the tanks began firing when they reached Potsdamer Platz; others had already started shooting on Unter den Linden. Some of the Volkspolizei belatedly began using their pistols. Most people ran away, and hardly any fought back. What was there to fight back with? A few people threw stones, but there wasn’t anything else. Some fifty people are thought to have died that day, though the numbers have never been confirmed. Hundreds were arrested, of whom thirteen were eventually sentenced and executed as traitors. Not all of the victims were demonstrators: in Rathenow, a Stasi functionary died after an angry mob dragged him into the canal and prevented him from getting out again. In the melee, Polkehn was arrested. He was dragged into a truck, waving his press card to no avail, and taken to Soviet headquarters at Karlshorst. He spent two days there, emerging filthy and hungry but relieved. Most of his fellow prisoners seemed to be there by accident: they had joined the demonstrations out of curiosity, or perhaps naïve conviction. Not all of them were from Berlin. Indeed, demonstrations took place in all of the major cities and industrial centers that day, especially those with a strong communist or social democratic tradition: Rostock, Cottbus, Magdeburg, Dresden, Leipzig, Erfurt, and Halle. In total, about 500,000 people in 373 towns and cities went on strike in about 600 enterprises. Between a million and 1.5 million people took part in demonstrations of some kind. 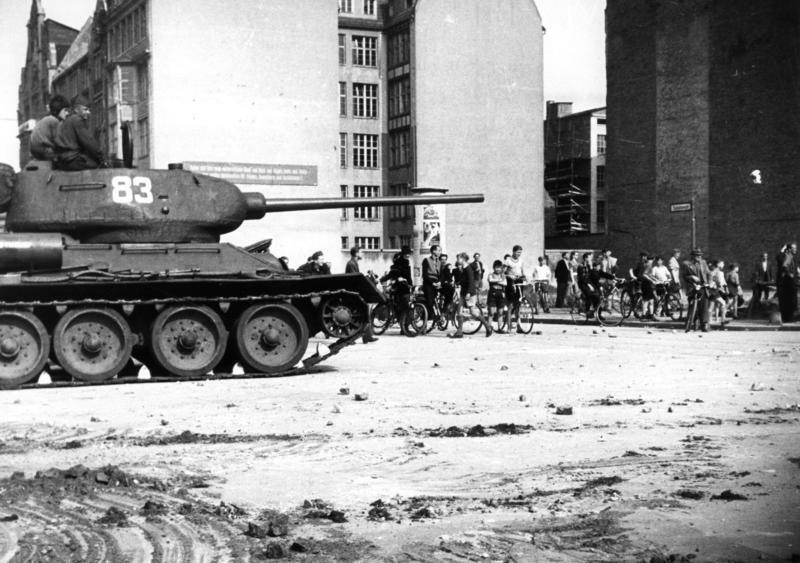 In Berlin, the appearance of Soviet tanks had ended the demonstrations. But by the time Semyonov sent his first cable to Moscow at 2 p.m., a good deal of damage had been done in the city and across the country. The windows of government offices had been smashed and a bookstore selling Russian books in central Berlin had been ransacked. 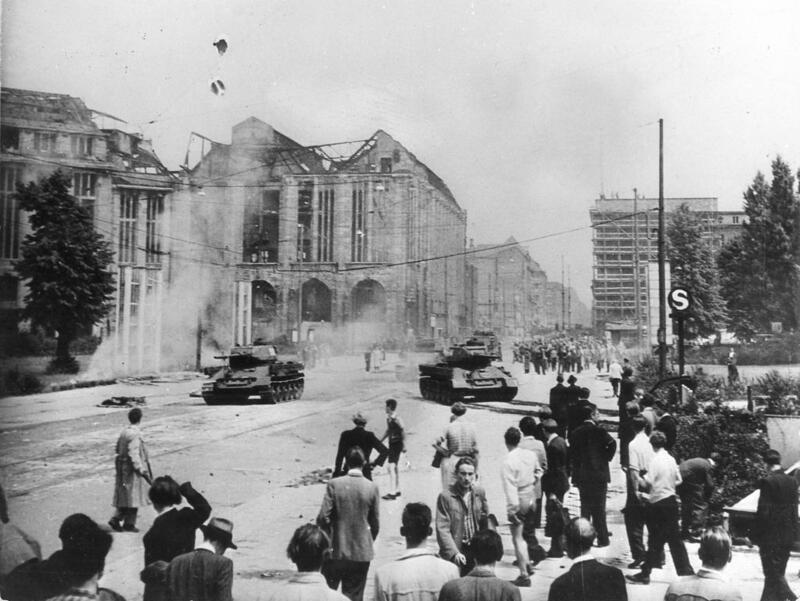 In the town of Görlitz on the Polish border, a mob of 30,000 had destroyed the headquarters of the communist party, the offices of the secret police, and the prison. In Magdeburg, the party headquarters and the prison had actually been set on fire, and in factories near Halle workers had overwhelmed the police. There were some more subtle rebellions as well. In one factory, workers struck up a “whistling concert” in order to drown out the propaganda coming out of the sound system. Initially, the Soviet authorities did not blame the West at all. In his first reports, Ambassador Semyonov spoke about strikers, workers, and demonstrators. Later his language changed, and he began speaking of provocateurs, ringleaders, and rowdies. Eventually, Soviet reports spoke of a “great international provocation, prepared earlier by the three Western powers and their accomplices from the circles of West German monopolistic capital”—though even then they conceded that there was still a “lack of factual material” to justify this thesis. For the Soviet diplomats and officers in Germany, the “provocation” explanation may have been a face-saving measure, a way to conceal their own failure to predict or prevent the riots. But it also might have been the only explanation that made sense to them. According to their ideology, their education, and their prejudices, this sort of thing wasn’t supposed to happen. Not only was it impossible for workers to rise up against the workers’ state but Germans were not supposed to oppose any authority at all. Stalin himself had once laughed at the thought of political protests in East Germany: “Revolt? Why they won’t even cross the street unless the light is green.” But Stalin was dead.